There’s a growing gap between travel and tourism websites, as a new report deems Germany’s tourism website number one in the world. The first ever global study, entitled ‘Destination: Marketing’ conducted by Byte Level Research, a research and consulting company, suggests tourism websites are “not so globally friendly”. “While the average leading travel website supports 30 languages, the leading tourism websites support just 12 languages, and many support considerably fewer,” the report suggests. And yet, the report states the “travel industry is at the forefront of web globalisation innovation and best practices. The travel and tourism industry is growing at a faster pace than the global economy and by 2017 is projected to account for one in nine jobs on this planet. And yet too many tourism organisations are “under-investing” in this growth industry, the report claims. The report includes more than 150 real-world screen shots of best (and poor) practices, looking at 55 country, region & city websites. So what does the top 10 look like? Well Australia makes two appearances, but it’s not Tourism Australia that led us to success. Petra Hedorfer, Chief Executive Officer of the German National Tourist Board (GNTB), said that more than four fifths of all European travellers to Germany jump online prior to visiting. “More than four fifths of all European travellers to Germany use the Internet for their travel preparation, either for information or as a booking option; visitors from overseas to Germany represent an eighty-five per cent share of Internet,” he said. “The GNTB started at a very early stage to offer online content not only in multiple languages, but also to expand our market-specific content. 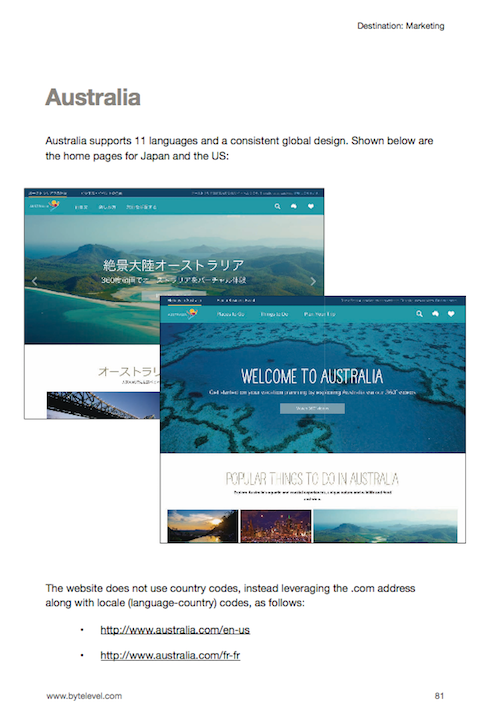 Tourism Australia was one of the websites analysed, with the report noting that in its comparison of two country versions – Japan and the US – there was a “consistent global design”, with 11 languages supported. It also noted the website does not use country codes, but rather builds off the global ‘.com’ address, for example: http://www.australia.com/en-us or http://www.australia.com/fr-fr. Meanwhile countries like China, which make up one of the world’s largest both in population and economy, are said to still have “a very long way to go before it offers a world-friendly website”. There were also two separate tourism websites identified in China rather than one unified one. The report also offers suggestions for more relevant and user-friendly websites to encourage more visitation. “Websites should use global design templates to ensure a consistent user experience and to minimise internal website management costs,” it writes.